After spending a couple of hours in Purpleworld I turned my attention to the main beach, at the back of which is an easily accessible cave. Following heavy rain a stream runs down over the cliff-top and deposits its contents on the beach, cascading across the cave entrance on its way. This immediately suggested another photo-opportunity. A waterfall is great subject matter and I have photographed them many times. In a typical location in Wales – shady and overhung with trees – I find they are often best tackled during cloudy conditions. This removes potential problems of excessive contrast if there is any risk of stray sunbeams reaching the image anywhere! A polariser is advisable to remove reflections from wet rock, a tripod a necessity, and a typical exposure will be about 0.5 second at f16; the small aperture will reduce any depth-of-field problems to a minimum. This technique allows the cascade to register on the sensor as a silky flow rather than water in stopped motion. Neither is an accurate representation of what the eye sees but only a movie camera could reproduce that. In actual fact waterfalls are quite easy to photograph in this way, and those with a good eye for composition will often produce a striking image. But there are an awful lot of well photographed waterfall images about! So when I have the time and opportunity I try to create something different and more abstract. I might use a telephoto lens at minimum focus for extreme close-ups, for example, and I have been behind waterfalls and photographed back out through the cascade (in the Upper Neath Valley for instance). On this occasion – by now a bright and sunny morning- the curtain of falling water was brightly lit against the darkness of the cave interior. 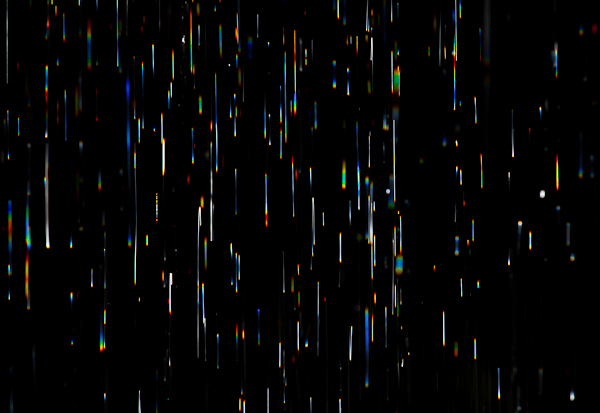 On examination through the telephoto lens each individual drop was acting as a prism and splitting the sunlight into a spectrum of colours. Wow! I began work on a series of images, but it proved very frustrating. Using a variety of different ISO’s, shutter speeds, apertures and focal lengths, I tried to find the best combination. Some exposures produced what looked like a completely dark LCD image, but when seen on the monitor at home contained a few coloured streaks. Others seemed to be so overloaded with light streaks that they were almost white on the LCD. The cascade changed course and location unpredictably and the wind changed the angle at which the drops fell. A partial rainbow appeared in fine spray within, alongside or behind the main fall. To cap it all the tide was coming in and I was worried I might get trapped by rising water! After half a lifetime photographing in the landscape I don’t think I have ever come across a more difficult subject. In the end it was the very first image that was my favourite, reproduced above. It is, in fact, by far the best picture of its type I have ever taken, and deserves to be seen much larger than it is here! You might wonder what post-processing I have used on it. Well, a slight crop and sharpen but you’d expect that. The main change I made was to the black point, moving the “blacks” slider in Lightroom 4 well to the left. This had the result of turning pale, out-of-focus (but just visible) background streaks into darkness. Oh, and I removed two short, out-of-focus, white foreground streaks using the Lightroom clone tool.